For anyone who has ever read the Barsoom saga from Edgar Rice Burroughs (basically John Carter and Dejah Thoris emanate from), will get a kick out of reading this issue by Burnham. Why? Well, you can kinda tell what is happening from page to page because Burnham follows very closely the events of The God of Mars minus John Carter. 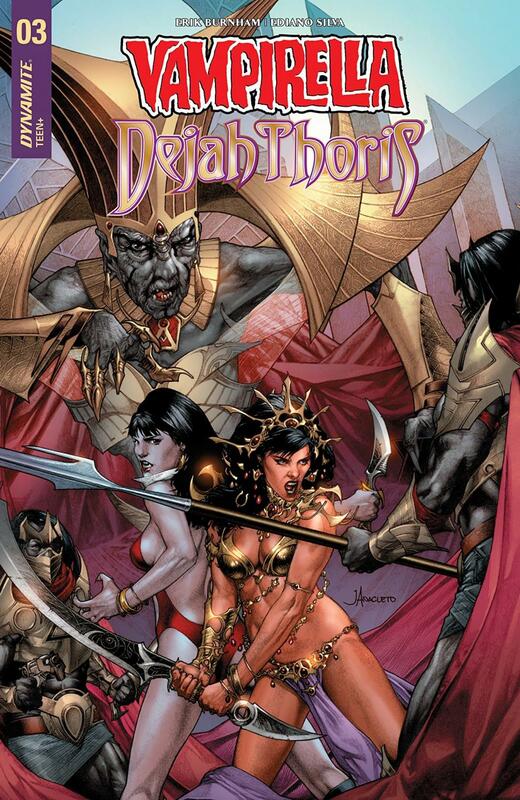 In the last issue, Vampirella and Dejah Thoris were captured by the Therns and are learning some harsh truths about Mars’ religion at the same time. Oh, and what is to be their fate (hint: it’s not great). This being a comic though, the action picks up pretty quickly as we learn that the Therns are not the only race living at the proverbial end of the world, there are also their sworn enemies: the First Born (and here, I’m really glad Burnham uses that term instead of the original, much more racist term Burroughs used). From this sequence, we start gleaning how Vampirella will be able to save her people (who we are reminded are hurtling towards Mars as they escape the dying planet of Drakulon) and more of the secrets of the Mars religion. I have to say that I really enjoyed Burnham’s take on The God of Mars plot and using Vampirella and Dejah Thoris to further everything. It’ll be interesting to see where we go from here and if Burnham will continue borrowing from Burrough’s plot. On art, Silva and Ribeiro make sure to make the action fluid and the colors/inks pop off the page. I’ll also mention that the design for the Therns and the First Born are interesting and not at all how I previously imagined them. Very good.